Yes Scotland (or maybe the SNP masquerading as Yes Scotland again, for all I know) recently issued this minor propaganda artifact after something Johann Lamont said. Would that be removing to somewhere else, or removing altogether, ie. forced unilateral disarmament? In the former case, the only big difference that would make would be to the UK's defence budget. In the latter, forcing the UK to abandon its nuclear deterrent would hardly do much to ingratiate ourselves to our newly-estranged neighbours, would it? Especially when the new state of Scotland would be dependent on much goodwill from the continuing UK for many things. It could also be argued that unilateral disarmament would be squandering the potential to contribute to future global multilateral disarmament initiatives. Something the Scottish Government could effectively do now, if the current incumbents' monomania with separation wasn't taking priority. Again, something that could be done now, if only there was the political will. I think you'll find Evil Etonian Tory Toff Lord Dave Snooty thinks that's a great idea too. Whether you consider the interventions in Iraq and Afghanistan illegal, dozens of countries all over the world got involved, including Norway, Denmark, Sweden, Switzerland and even Ireland (in it's own small way). Why would a hypothetical separate Scotland (and a NATO member to boot, if you're gullible to believe the SNP's current position on that) be any different? 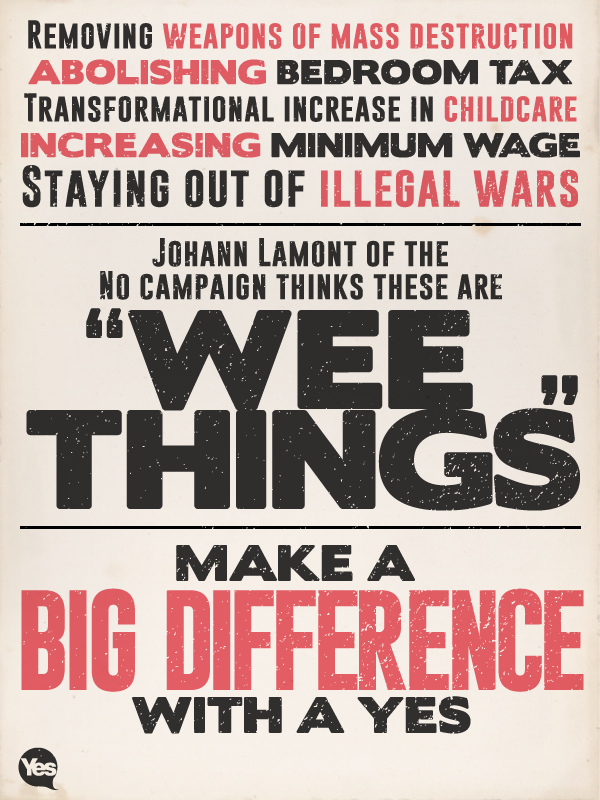 They might not be "wee things", but where's the "big difference"?